Wash and peel the cucumber and the jicama. Finely mince them and place them in a covered bowl. Put the bowl with the cucumber and jicama in the fridge for 20 minutes. Just before serving, add orange juice, cheese, chile, salt to taste and stir well. Put it in small bowls and serve very cold. If you are using fresh oranges for the juice, put them in the fridge the day before. The juice will be cold and refreshing. Use a potato peeler to peel the jicama and the cucumber. This will be easier than using a knife. When the heat starts to rise, we favor refreshing and light snacks. Am I right? What is great about this season is that we have lots of fruits and vegetables available to prepare delicious combinations. Today I am going to give you the recipe for one of these delightful combinations, which is sure to cool you off on a warm day and leave a great taste in your mouth. The great thing about this cucumber and jicama gazpacho is that you can serve it an entrée or salad, or as a snack for children. I really like having it as part of my lunch. 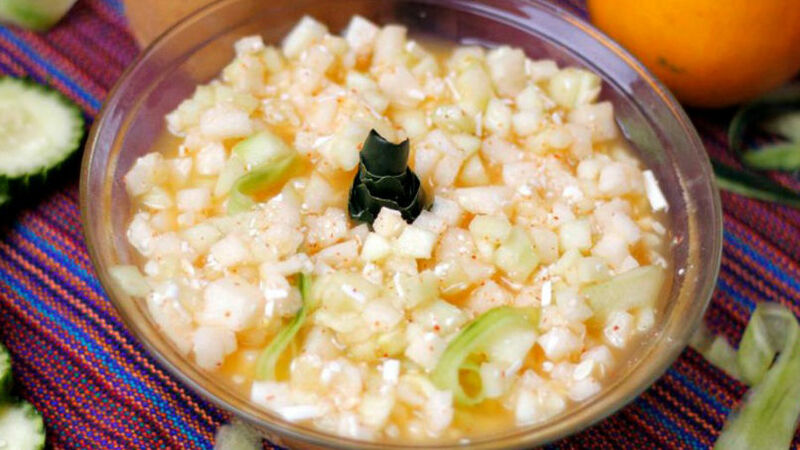 Using salt and chile on fruits and vegetables is very popular in Mexico. The salt highlights the sweetness and I invite you to try it. The taste of this gazpacho is so delicious that even children will eat it without hesitation. This will definitely please those moms who want to add more fruits and vegetables to their children's daily menu.